In the previous post we are discussed about working principle of transformer.In this article the amount of emf induced in the secondary winding due to the current supplied to the primary winding can be calculated by EMF equation of the transformer.This is very essential in the designing process of any transformer.Because amount of emf induced due to mutual induction also depends on number of turns in the coil.Transformer emf equation gives the output voltage value,so that we can design a transformer as per our requirements. f = frequency of the AC supply (in Hz). Flux propagates in the sinusoidal wave form.If the time period of the flux wave is 'T' sec.Then it reaches it's maximum value Φm in T/4 sec i.e.,quarter of the cycle.We know that T=1/f (f is the frequency of the sine wave). Average rate of change of flux = 4f Φm ....... (Webers/s). So, average emf per turn = 4f Φm ..........(Volts). Since,Form factor = RMS value / Average value. RMS value of emf per turn = Form factor X Average emf per turn. 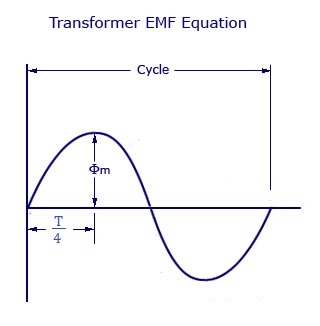 Therefore, RMS value of emf per turn = 1.11 x 4f Φm = 4.44f Φm Volts. By dividing eqs (1) & (2). 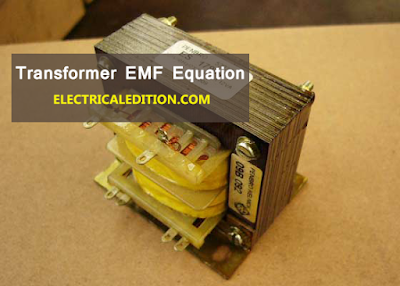 The above relation between primary and secondary induced voltages is called the emf equation of transformer.We can observe emf / number of turns is same for both primary and secondary winding of a transformer. Based on the requirement we can use any transformer as step-up or step down by changing the supply.